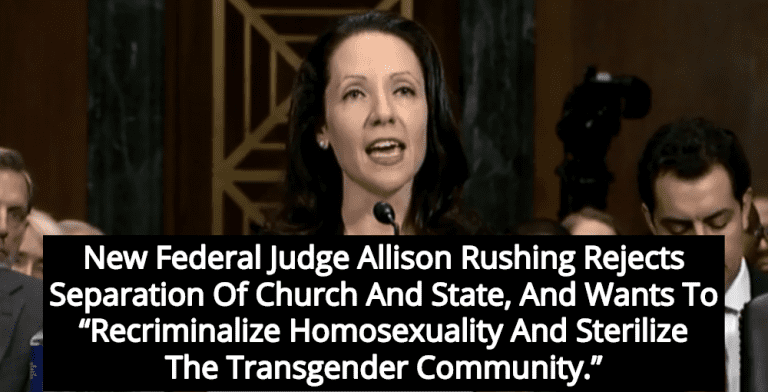 More of that Christian theocracy: Allison Rushing, a dangerous religious extremist and former warrior for an anti-LGBT hate group, has been confirmed to a lifetime appointment as a federal judge. Rushing was confirmed to the U.S. Court of Appeals for the Fourth Circuit by the Senate earlier this week on a 53-44 party-line vote, with all present Democrats voting against her, and all present Republicans voting for her. The confirmation makes Rushing, 37, the youngest federal judge in the country, and also one of the most dangerous. Before being confirmed Rushing worked for the Alliance Defending Freedom, a conservative Christian organization that has been classified as a hate group by the Southern Poverty Law Center. In her writings, she has rejected the separation of church and state while arguing that “village secularists” and other “offended observers” should not be allowed to challenge government actions that violate the Establishment Clause which guarantees the separation of church and state. 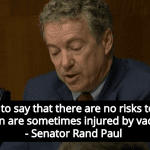 … in 2005 Rushing penned an article for Engage, The Federalist Society’s journal, entitled “Nothing to Stand On: ‘Offended Observers’ and the Ten Commandments,” written in conjunction with a senior counsel for the Alliance Defense Fund (now Alliance Defending Freedom), an organization that the Southern Poverty Law Center has designated a hate group. 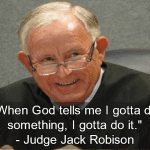 In it, Rushing argued that “offended observers” should never be allowed a day in court to challenge government actions that violate the Establishment Clause, leaving citizens completely unable to hold the government accountable even for some clear constitutional violations. Throughout her brief legal career, Allison Rushing has supported and closely associated herself with one of the most extreme anti-LGBT organizations operating in this country today, the Alliance Defending Freedom. Rather than disqualifying her from consideration, this aspect of her record seems to have made up for all of the other deficiencies in her record, including her inexperience and he lack of any connection to the state in which she will sit. Despite her denunciation of the Supreme Court’s marriage equality decision in United States v. Windsor, and her commitment to ADF’s mission to recriminalize homosexuality and sterilize the transgender community, all 53 Republican Senators voted to confirm her. Today is a very difficult and disappointing day for the roughly 1 million LGBT people who live in the states covered by the Fourth Circuit, and for all people who care about courts that can treat all people with dignity and fairness.